Match preview, betting tips and enhanced odds for Scotland v Ireland. The Scots went 33-3 up against Italy last weekend before switching off and allowing their visitors 17 unanswered points in the final 10 minutes. However, they’ll still take positives from that 70-minute defensive performance even if it was against a side that have lost 18 straight Six Nations matches. Meanwhile, Joe Schmidt’s chargers suffered their first defeat since losing Down Under last summer to a rejuvenated and very physical England side. Ireland will know this is a must win game. Momentum plays such a crucial role in this tournament and a defeat here could well bring about a few whispers of a potential remake of Eddie Jones’ 2018 side. On the road to tier one opposition they don’t have the best of records though, losing seven of their 13 trips since the last World Cup, and so they’ll need to be on top of their game to get a result. That run includes a defeat in their last visit to Murrayfield back in 2017, while they only managed to cover the -5.5 point handicap in three of those 13 trips, so that looks a tall order. Scotland welcome the return of both Sean Maitland and Jonny Gray to their starting XV, while the injured Willem Nel is replaced by Simon Berghan. Ireland, on the other hand, will go to battle without ball carrying machine CJ Stander, while Devin Toner, Garry Ringrose and Robbie Henshaw are also absent. Rob Kearney returns to full-back with Chris Farrell into the centres and Sean O’Brien gets the nod to start in the backrow to try and fulfil the carrying duties of the missing number eight. 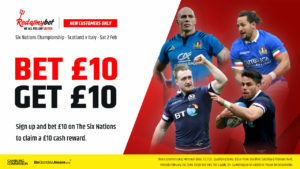 The Scots have turned Murrayfield into a bit of a fortress in recent years, only losing two of their 10 matches here to tier one opposition since 2017 – against New Zealand (22-17) and South Africa (26-20). In fact, they haven’t lost at home for the last two Six Nations campaigns, and while they’re a tempting bet in the outright market, we expect a reaction from Joe Schmidt’s men, so preference is to back the hosts on the handicap in what has all the elements of a very tight encounter.